Abacus Kowloon made it three wins in a row in the Paul Y Hong Kong Rugby Union Premiership on Saturday Oct 19 to keep them on top of the standings, however their lead could be at risk with a game’s played imbalance. Leighton Asia Hong Kong Cricket Club (HKCC) have only played two matches and are only four points behind Kowloon. With a match between the two undefeated clubs next week at Aberdeen Sports Ground being an important tie, Kowloon’s hold on the leadership could be narrowed, tied or overtaken. Alternately, Kowloon could take a commanding lead with a big win. Leighton Asia HKCC will be coming off a strong 52-13 win at King’s Park against a struggling Borrelli Walsh Tigers—who are yet to record any points from their three matches to date. While HKCC won easily, Kowloon will be coming off a tough encounter against Newedge Club—who are still struggling to get their game in top shape, but there was evidence of further improvement in their hard-fought match at home. Although Club lost the encounter 6-11 they were one point up at half time when the score was 6-5 in an even battle. A penalty and a drop goal by Kowloon flyhalf Chris McAdam in the second half secured the win. Winning away from home against Newedge Club gives Kowloon a strong psychological advantage to push further ahead (this pair will meet again in a couple of weeks at King’s Park). Kowloon will meet a fired-up HKCC in the first match of this Saturday’s (Oct 26) fixtures starting at 4.30pm. It will be interesting to see how they respond following the nature of the past weekend’s results. 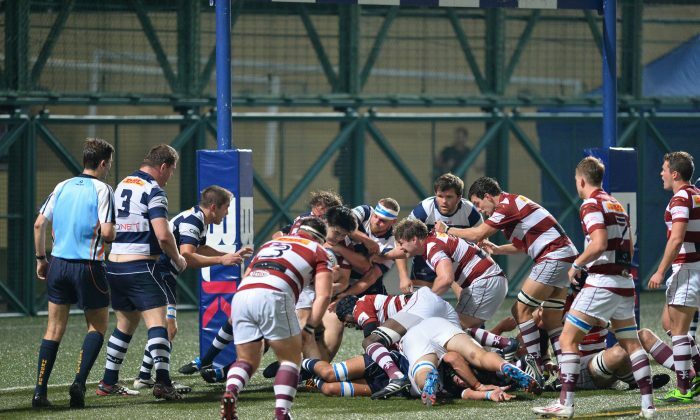 Despite being back to full strength with the return of their Sevens players, WhichWayValley struggled to dominate against a defiant Hong Kong Scottish, who were looking for their first points of the season. Although Valley opened the scoring, on their newly laid artificial turf on Valley-8, through a Khrist Kopetzky penalty, mistakes in the Scottish half gave Danny Kroll the opportunity to put Scottish 9-3 in the lead at half time. Although Adrian Griffiths came close to scoring for HK Scottish in the second half, he was pushed into touch by Valley winger Salmon Yiu close to the line. It was a good contest with good defence and long kicks up field by the backs to gain territorial advantage. Valley edged ahead in the penalty shootout and were three points clear towards the end of the match, but Scottish secured a penalty in front of the posts at full time to even the match at 18-18. Kroll kicked all 18 points for HK Scottish, while for WhichWay Valley Kopetzky nailed four penalties and Ben Rimene added the other two. Remarkably, Scottish, looking for their first points, had held Grand Champions Valley to a draw to get them off the bottom of the table. Meanwhile, Valley, like HKCC, have also only played two matches, but are lying third in the standings table on 7-points having secured a win and a draw.